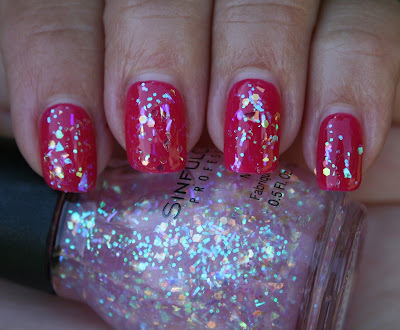 Sinful Sunrise is described as "warm pink with silver 3D confetti". It's part of the 2015 Back To School collection, A Class Act. I decided to use it over SinfulColors RADient and I really liked the effect the glitter topcoat gave. One coat gave me pretty good coverage, although the first swipe out of the brand-new bottle was a bit lacking. You can see that on my pinkie finger. Once I dipped back in the bottle for subsequent fingers, I thought the coverage was perfect. Awww...love it! I love the color and glitter topper. I think its a must try.